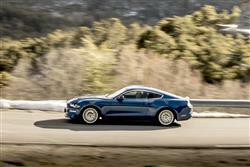 As before, the Mustang offers a choice between two very different powerplants. While there will be many who don't see the point in choosing anything other than the 5.0-litre V8, Ford predicts a good take-up of the 2.3-litre Ecoboost turbo four. With UK pump prices being what they are, you can see the logic. It's not exactly limp-wristed either. With 290PS to call upon, it'll get to 62mph in around 6 seconds in six-speed manual guise. As an option, Ford now offers an auto transmission with no fewer than ten speeds. The brand claims that this new auto 'box offers greater fuel efficiency and improved acceleration. The gearbox's electronic control system enables settings that optimise performance for the car's various Drive Modes, plus there's real-time adaptive shift-scheduling that allows the transmission to adapt to changing conditions and select the right gear in any situation - from coast-road cruising to the drag-strip. In short, for the right buyer, the 2.3-litre EcoBoost Mustang variant could now be quite a tempting proposition. Look at the ballistic V8 version though and your resolve might weaken. Its output has now been increased to 450PS, plus there's more low-end torque than there was before. As for driving dynamics, well Ford claims to have improved these for European buyers with this enhanced model. Recalibrated shock absorbers should improve stability through corners, while the rear suspension has been stiffened with a cross-axis joint that reduces unwanted movement at each corner that can lead to body flex. Thicker anti-roll bars also better control body-roll for sharper handling. A new optional MagneRide Damping System can deliver a lightning-quick response to changing road conditions. Plus there are two new Drive Modes in addition to the usual 'Normal', 'Sport', 'Track' and 'Snow/Wet' settings. 'Drag Strip Mode' optimises performance for maximum acceleration from standing starts. And 'My Mode' enables drivers to select their own preferred settings for performance, dynamics and exhaust sound. In addition, the car also has a 'Good Neighbour Mode' that can be programmed to automatically limit the exhaust's noise output at pre-programmed times of the day to avoid disturbing your neighbours, not least when firing up the legendary 5.0-litre V8 early in the morning. 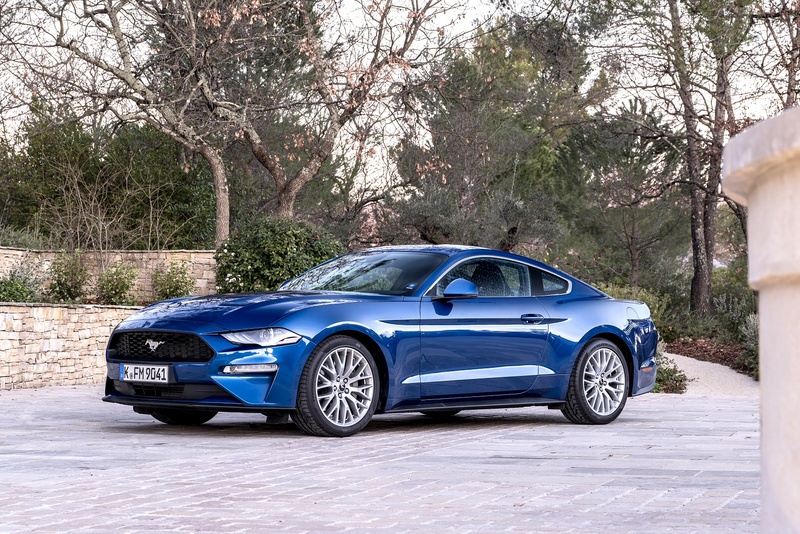 Buyers continue to choose between fixed-top or Convertible bodystyles and it's the coupe that most distinctively retains the characteristic fastback shape the Mustang has always had, a look which first debuted way back in 1965. Let's talk you through the changes made to this revised model. The bonnet profile is now lower with integrated air vents, combined with a revised lower grille design to give the Mustang a sharper, more aggressive face, while improving aerodynamics. The headlamps and tail lights have been re-styled too and at the rear, there's a sleeker bumper and a more aggressive diffuser. 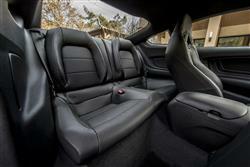 Inside, Ford has tried to give the cabin more of the premium feel you get in notable German rivals. Soft touch materials now feature for the door linings and the door handles are finished in aluminium. The centre console features a smarter hand-stitched, soft-touch wrap, finished with stitching in a contrast colour for a more dynamic and upscale feel. Leather-trimmed, heated and cooled seats, and a heated steering wheel are also offered across the line-up for the first time for ultimate comfort. There's also now a customisable, all-digital, 12-inch LCD instrument cluster and the centre-dash infotainment system has been upgraded to 'SYNC 3' status, which includes 'Apple CarPlay'/'Android Auto' smartphone mirroring functionality. 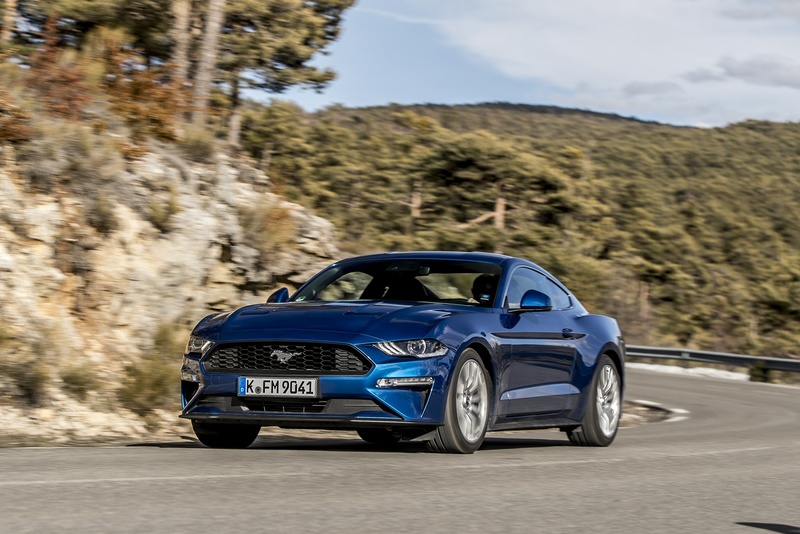 None of this is going to leave the likes of Audi and Mercedes reaching for their drawing boards anytime soon, but a Mustang needs to feel like a Mustang; a proper blue-collar, hairy-chested people's sports car. No, that's not a cop-out: Ford had long and detailed discussions about this. Mustang buyers have an expectation of a certain straightforwardness about the car and Ford needed to guarantee this while at the same time improving interior quality. It actually strikes a nice balance. It's not chi chi but then neither does it feel like a holiday rental. Prices are much as before, mainly pitched in the £36,000 to £47,000 bracket. In terms of performance-per-pound, that still represents an awful lot for your cash. Essentially, the choices here are simple. 'Fastback' coupe or Convertible bodystyles; 2.3-litre turbo four cylinder or 5.0-litre V8 GT power; and six-speed manual or six-speed auto transmission. That's it. No fancier trim levels, no all-wheel drive option: you get it as it comes. 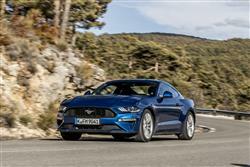 You won't be surprised to hear that the base price applies to the 2.3-litre EcoBoost 'Fastback' coupe manual version; for a 5.0-litre V8 Fastback coupe GT manual model, the starting price would be over £41,000. Add £3,500 to each of those figures if you want the Convertible bodystyle. And a further £1,500 of you want the auto gearbox. Safety's been improved, this enhanced model now featuring autonomous braking - Ford calls it 'Pre-Collision Assist with Pedestrian Detection'. 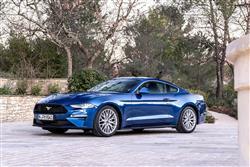 The Mustang is also now offered with Adaptive Cruise Control and Distance Alert technologies that help drivers maintain an appropriate distance to the vehicle ahead, as well as Lane Departure Warning that can warn when drivers unintentionally drift out of lane, plus a Lane Keeping Aid that can apply torque to the steering wheel to steer the vehicle back into lane. If you hold great store in miles per gallon figures, don't ever, ever take a test drive in the 5.0-litre V8 Mustang. It'll ruin you for the Ecoboost model. The 2.3-litre car returns an economy reading that is actually quite impressive for such a big, powerful, petrol-engined car, getting 31.4mpg on the combined cycle and 199g/km of CO2 with a 6-speed manual gearbox. Choose that heavy hitting V8 instead though, and you'll emit 270g/km: the official combined consumption figure is 23.3mpg, but if you can get the fuel meter to average into the twenties, you have more restraint than we could manage. 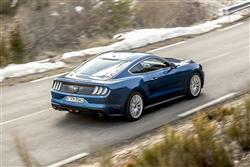 The 2.3-litre EcoBoost engine uses direct injection, variable cam timing and turbocharging to deliver its efficiency. A unique intake manifold and turbocharger housing enable it to make good on the performance Mustang drivers expect. The automatic transmission versions feature steering wheel-mounted shift paddles, which isn't really very 'Mustang'. Ford says that the extra ratios of the new 10-speed auto gearbox will improve efficiency. Perhaps so, but don't expect the gains to be spectacular. If you�re looking for a new Ford Mustang 5.0 V8 GT [Custom Pack 2] 2dr Petrol Coupe for sale, you�ve come to the right place. 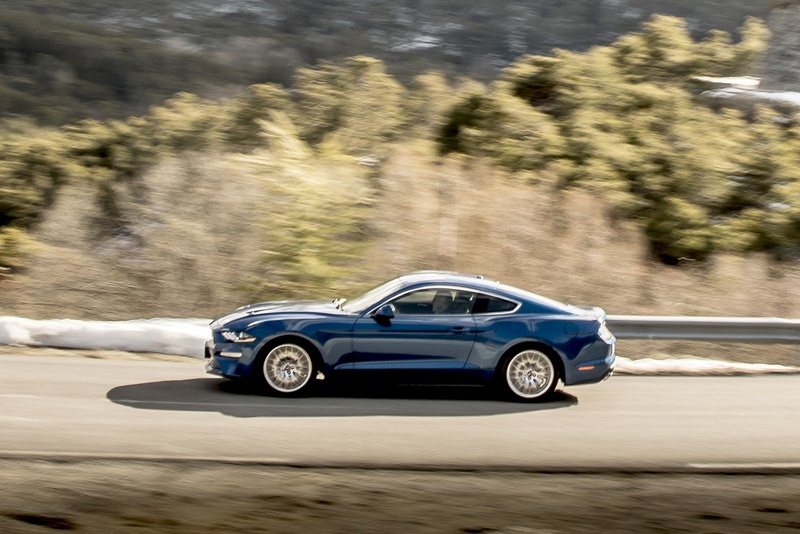 At Bristol Street Motors we don�t just have the best Ford Mustang 5.0 V8 GT [Custom Pack 2] 2dr Petrol Coupe deals, we also offer friendly advice and help with all your enquiries to ensure your buying experience is a happy experience.